One of the things we’ve noticed over the years of using personal mixers is that it can be really hard to find your own channel while you’re focused on playing. You’d think that it would be pretty easy, but based on what people have told us over the years, we’re not the only ones. It’s not at all unusual to run into a personal mixer with one channel highlighted or even with an arrow pointing to it, to help the musician find his or her channel quickly. It’s not that musicians can’t read or remember basic information; it’s that when you’re focused on making music, you’re focused on pitch and timing and phrasing and blending, and you’re in a completely different brain space than the part you use to find your channel on a mixer. So when you need to make a change, it can take a beat to shift gears. And that’s a beat you’re not focused on the music. So one thing the Dual Profile Channel on the A360 Personal Mixer does is allow everyone to have their favorite or most important channel (usually it’s their own channel) in an easy-to-reach spot. The lower right hand corner of the interface is prime real estate, and with the Dual Profile Channel set off a bit from the 16 regular mix channels, everyone can get to their favorite channel quickly and easily and without taking the beat to shift gears. The other main function the Dual Profile Channel serves is, as its name suggests, providing two profiles for that channel. A profile (A or B) is simply a channel-level preset, a combination of values for channel volume, stereo placement (pan and spread, if it’s stereo), reverb, and tone stored for that channel. A vocalist could use this to switch his or her mic from a profile designed for singing lead (a bit of reverb, more volume, a bit brighter tone, centered pan) to one for blending with an ensemble (less volume, flatter tone, etc.). The Dual Profile Channel is designed to make changing your setting fast and easy. As we mentioned previously, any time spent on fiddling with mix settings is time that you’re not concentrating on performing. While you might have all the time in the world at a rehearsal, when you’re performing, time is of the essence. 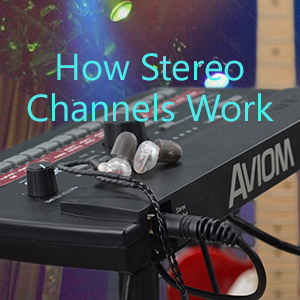 The Dual Profile Channel is perfect for anyone who plays multiple instruments. Set up Profile A for your acoustic guitar and Profile B for your electric guitar. If you’re a drummer, maybe you use a laptop to play stereo backing tracks from a DAW’s sequencer for some songs, but on others you need a mono click track in just your left ear. With the Dual Profile Channel, making the switch between these drastically different settings can happen with the touch of a single button. The other nice thing about the two profiles is that they affect only the Dual Profile Channel itself and not any of the other mix channels, like recalling a mix preset would do. Why is that a good thing? That means that changing your profile won’t overwrite other tweaks you’ve made to your mix. The settings for the A and B profiles are stored as part of the mix presets, so if you do want to change the mix as a whole (including your channel), you can still do that. With the Dual Profile Channel, though, you don’t have to. If you’re using the A360 in a 16-channel Pro16 system or you’re using the A360 in Default mode (i.e., you’re not setting up custom channel configurations for everyone), you can still customize what channel is assigned to the Dual Profile Channel for each A360 in the system. Just press and hold the Dual Profile Channel and then select the channel button you want to mirror to make the assignment. The free A360 Channel Manager application allows you to assign any network channel to any A360 mix channel button. 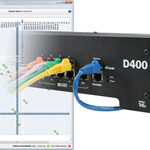 This is especially powerful when you have a system that uses multiple input devices (analog or console card) or a Dante network. 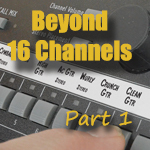 A system with 32-64 inputs allows everyone to get the specific channels they need, and to have the channels appear in whatever order works best for them. Assign any network source to an A360 mix channel button. A360 Channel Manager uses a simple set of drop-down menus that allows you to quickly select which network source gets assigned to each mix button. Custom configurations can be saved to a USB flash drive and then loaded into an A360 Personal Mixer.